Safety is the state of being "safe", the condition of being protected against physical consequences of damage, accidents, harm or any other event which could be considered non-desirable to health. Safety can also be defined to be the control of recognized hazards to achieve an acceptable level of risk. This can take the form of being protected from the event or from exposure to something that causes health or economic losses. 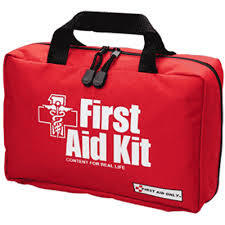 First aid is the first and foremost treatment given to the victim of sudden accident or injury. It is the first assistance given to a casualty before the arrival of an ambulance to a qualified person. Certain minor injuries may not require further medical care past the first aid intervention. To provide immediate help to the victim. To prevent bleeding by pressing the wound by the hand or by tying a handkerchief. To provide emotional support to wounds. To keep a victim of an accident in safe and comfortable place. To provide artificial respiration to the victim who has become unconscious from an accident. To make necessary arrangement to take a patient to a nearest health center. The strain on the joints due to the twisting of muscles is called sprain. In a sprain, the tendons and ligaments at the joints get affected and become difficult to move. During sprain, the joints aches, and swells. Walk carefully in and outside the house. Start playing games only after warm up exercises. Be careful while playing games like football, volleyball and while jumping, running, throwing. Avoid the activities like high jump, long jump, supporting heavy things with the hand. Keep the victim at a comfortable place so that the sprained organ or organ does not get worse. Provide artificial respiration if the respiration has stopped. Provide the victim with warm milk, tea, fruits, juice, and water. Comfort him with soothing words. Disperse the crowd and make surrounding peaceful. The strain on the joints due to the twisting of muscles is called sprain. Safety can be defined as the control of recognized hazards to achieve an acceptable level of risk. First aid is the first and foremost treatment given to the victim of sudden accident or injury. What are the objectives of first aid? To keep the victim of an accident in safe and comfortable place. To make necessary arrangement to take the patient to the nearest health center. Write the first aid treatment of sprain. How can we prevent from sprain? What do we mean by first aid? Which of the following do not need first aid? Which one of them is the aim of first aid? Which one of them is not the aim of first aid? The first aid for the sprain includes _____. The aim of first aid is to provide ___________ to the victim. We should_______ our hands and feet before playing. Sprain occurs when the ligaments that hold the bones together are __________. Any Questions on 'Safety and First Aid '?